Shenzhen Xunlong has been pretty busy churning out new boards over the last few months and years, but is still not active on the software side. However these days, it’s not that bad thanks to Armbian community which provides Debian based images, and supports Allwinner H3 boards pretty well. 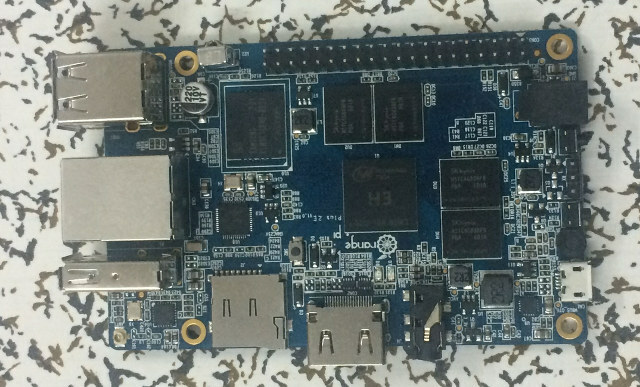 The company is now about to launch Orange Pi Plus 2E, based on Orange Pi Plus 2 which comes with 2GB RAM, but at a lower cost, by removing SATA, the need for a USB hub chip, and the camera connector, while still managing to upgrade the eMMC flash capacity to 16 GB. Power Supply – 5V/2A via barrel jack or 5V/GND header pins; Power and status LEDs; SY8106A regulator. The board was actually made based on requests from Armbian community, that asked for 16GB eMMC for better random I/O performance which is important if you intend to run the operating system, database applications, or any other application that requires many small I/O writes and reads, and the removal of the USB hub chip that shared the bandwidth with SATA and other USB ports. SY8106A regulator was also used to make sure there’s less throttling. Orange Pi Plus 2E will sell for $35. The company is also working on a $25 Orange Pi PC Plus board based on Orange Pi PC design, but adding WiFi and 8GB eMMC, and a board based on Allwinner A64 is also planned. It’s unclear when the new boards will be available. Nice to see they react on the proposals of the armbian community. 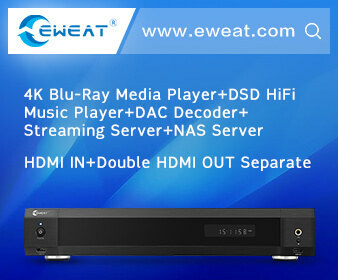 Sounds like a perfect small headless server? I would like to see some connectivity and storage benchmark charts. It’s time to learn a few things. For eMMC performance follow the above ‘better random I/O performance’ link to Armbian forum. Gbit Ethernet throughput is at ~500 Mbits/sec with mainline kernel (tested with 4.6-rc1 a few weeks ago) which might improve further. Using BSP kernel 3.4 it’s above 700 Mbits/sec. USB throughput with mainline kernel and UASP capable disk enclosure close to 40 MB/s (per port on the Plus 2E!) with BSP kernel at ~35 MB/s. @cnxsoft: It’s 1.3Ghz and Micro USB can not be used to power the board (without bridging a switch) but GPIO pins instead like with any other H3 Orange Pi (pin 2/4 5V, pin 6 GND). Thanks, I’ve fixed the specs. I had the similar ARM board as server but after some time I switched to x86. Mostly because of RAID.. But for newcomer its a quite easy setup. ODROID C2 is definitely faster when it’s about CPU bound applications. And the pretty expensive eMMC modules simply rock (see test of the 8, 16 and 32 GB modules in Armbian forum). But Orange Pi Plus 2E has way more I/O bandwidth available since on the ODROIDs all 4 USB receptacles are connected to one GL852 internal USB hub and sharing the bandwidth of one single USB host port whereas the Plus 2E has 3 dedicated USB2.0 host ports that do not have to share bandwidth (I measured combined +115 MB/s throughput with kernel 4.4 accessing 3 UASP capable USB disks in parallel). Regarding GbE both C2 and C1+ currently outperform Plus 2E but that might change if mainline Ethernet driver further improves. So it’s all about the use case (and the price: since Xunlong’s shipping costs aren’t that high expect to hold the OPi Plus 2E in your hands for less than $40). Please now make a similar board with usb3 or native sata for a reasonable money. Anyone know if we will be able to boot from the emmc chip? I saw someone posting in the armbian forums a while ago about this and they have succeeded in doing this but I am not sure if this capability is in the works for Armbian. Currently I think you have to bootstrap from the sdcard before control gets passed to the emmc chip for the main boot. Sdcards are not supposed to be very reliable so if the emmc chip can do all the booting wouldn’t this make the orangepi more robust? I don’t see any reasons why it would not boot from eMMC flash. It has to, it’s one of the selling point, and products on the markets all sell with a flash. There’s the PcDuino3 Nano Lite for $35 -> http://www.cnx-software.com/2015/12/16/15-pcduino-nano3-lite-includes-gigabit-ethernet-and-a-real-sata-port/ ($15 was a promotion). I have not heard many people use it though. PcDuino3 Nano Lite does have a very oold chip (A20) though… Maybe better to wait for USB3 on new chipsets. Of course it’s possible to boot from eMMC. It only gets a bit tricky if you want to use a (larger) SD card together with eMMC and want to benefit from the faster I/O on the eMMC. Because the bootloader has to reside on the SD card and switch from there to rootfs on eMMC. But this scenario now also works with Armbian’s nand-sata-install.sh script. PdDuino3 (Nano/Lite) do just work like any other NAS capable A20 device. The only thing you have to take care of is to avoid the manufacturer’s OS images. Well done (follow something than community want). OPPC has an internal ethernet Phy (undocumented) and this is always a problem for main kernel, happy to see Gigabit (external PHY) and good OPPC usb bus topology together on a new board. Hmm… H3’s internal Fast Ethernet PHY is neither undocumented nor known to cause problems. It’s just about spending the additional $1.20 for an external GbE PHY like RTL8211E or not. Mainline kernel support for both internal and external Ethernet PHY is fine and already production ready when using latest patches. Does that mean we’ll be soon able to build the Linux kernel (4.7? or greater) from kernel.org for Orange Pi boards directly? At least for headless servers. Glad to see it remove the stupid CSI DSI interface. It is not another RPi or Arduino. I don’t understand why so many clones. Looks great, but samba speeds are pretty poor and it uses and old chipset. I actually have an marvell based device ([email protected] dockstar). It was very cheap and has gigabit ethernet. But it uses usb2 so limits samba transfers to around 25MB/s. Now i want to upgrade to similar thing (small and power efficient) but there are not cheap option, that would provide full gigabit experience over network. And back to OPi Plus 2E (or H3 with GbE Ethernet in general). Using the right settings and mainline kernel you’ll be able to get NAS transfer speeds above 35 MB/s when using single disks (tested with BPi M2+ 2 weeks ago). With mainline kernel you can also use btrfs (transparent filesystem compression which improves performance depending on the type of data) and by using 3 disks and ‘wasting’ half of the drive’s capacity you can use RAID-10 (combining raid0 and raid1 by mixing mdraid with btrfs’ RAID implementation) to get NAS speed at ~50MB/s and full protection against failure of a single disk. 35MB/s is still pretty lackluster improvement against my current setup. i’m shooting for 100MB/s+ samba transfers, this is how fast the hdd i’m using is. Anything less is just a waste in my case. But by the looks of it, looks like ill have to look for something x86 based (which will obviously cost more). Thanks for information. I will try to make it work (internal phy 100mbit). Linux sunxi is well active, thanks for all. Either buy the cable with the Orange Pi or just search eBay/ Aliexpress they are cheap! Due to great community efforts since yesterday the new WiFi chipset on Orange Pi Plus 2E, Lite and PC Plus is now also fully supported and provides both AP and monitor mode while showing decent performance according to some testers. A modification of the formerly used driver was needed and some sort of hack to assign a static MAC address for WiFi. It seems currently only OpenELEC and Armbian fully support the new boards. Older Orange Pi distros might benefit from using the modified so called fex files OpenELEC/Armbian developed for the new boards but would also need to port the new fixed WiFi driver. The 3 new boards are made of a PCB that shows excellent heat dissipation so with just a small heatsink OPi Plus 2E is able to run heavy benchmarks at 1.3 GHz without any throttling occuring. On the smaller boards this heat spreading effect is not that large so they might throttle a little earlier under full load but the Armbian team also did again extensive testing and further improved thermal settings in fex file and also the kernel so just using Armbian’s and OpenELEC’s kernel improves performance on all H3 Orange Pi automagically since throttling occurs less/later. Apart from that compared to the old Orange Pi distros that use still a horribly outdated 3.4.39 kernel where not even the ‘rootmydevice’ flaw has been fixed we rely now on a newer BSP kernel from Allwinner and have tons of fixes on top (kernel 3.4.112 with ‘just’ a few hundred security fixes alone). So it’s really time to upgrade on older installations to benefit from countless fixes and better THS settings (thermal/throttling/performance)! Since this board with 2GB DRAM, pretty fast 16GB eMMC and plenty of real USB ports makes also a nice desktop replacement we hope that especially people trying to improve GUI stuff join our team. But of course anyone is welcomed who is willing to contribute to community efforts! You guys are definitely doing something great. I have to praise all the effort to make this into what I can call a real Raspberry Pi competitor on all levels. The work that had to be done in order to pressure both Allwinner and Xunlong, maintaining support linux-sunxi which even cooked up Cedrus. I will presume that the effort will be centered around teh H3 processor? The H64/A64 CPU which has aarch64 also seemed to interest others (not me), but I think it won’t really be all that popular as we are in the verge of octa-core CPUs entering the market. I wonder if eight Cortex-A53 is going to make that much a difference compared to four, with potential clocks up to 2 GHz? Either way completely useless with no Linux kernel support at all. I hope others join in and provide their differentation criterias.